Proud. 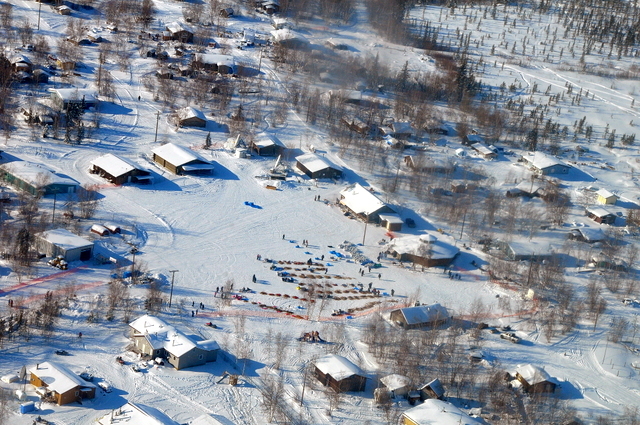 The word many of the villagers feel about having the Iditarod come through for the first time in history. Walking around the checkpoint you can see many children playing basketball, looking for mushers to sign their Huslia pennant, villagers volunteering, and snowmachines driving around. Inside there are tables overflowing with food for anyone to enjoy. There are also tables with villagers selling hand-made crafts, students selling t-shirts, and a group raising money for the Frank Attla Youth and Sled Dog Care Mushing Program. In 2012, legendary sprint sled dog musher, George Attla, started a mushing program in memory of his late son, Frank. The program was started to give the youth of Huslia hands-on experience and guidance by the Elders of the community as well as experienced dog mushers. Many local kennels use their dogs to teach the youngsters about dog care. The program has become part of the curriculum at the school in Huslia, Jimmy Huntington School. The mushers and the staff of JHS work together to plan the classes and help the students plan their own junior sled dog races. The program teaches literacy and numerical skills as well as dog care which includes feeding, maintaining a dog yard, and overall health care. All students are in training to be able to race their own team by learning dog handling and mushing skills. The program works with students from Headstart up through 6th grade. The program has been quite positive for all involved. Students are more engaged in class and grades are increasing. George Attla believed young people feel more at ease with themselves around dog and in a dog yard because a dog accepts anyone without judgment. What a remarkable program to help students learn leadership, discipline, and life skills. Meanwhile in the food and gathering building, villagers are enjoying the excitement of the Iditarod. People are sharing stories of the past and reminiscing about old times. Everyone has a smile on their face. Suddenly the door flies open and someone shouts, “Dog team coming!” Instantly everyone grabs their gear and bolts out the door. The only ones left in the building are a few sleep deprived mushers eating their dinner. We all head out and see Jessie Royer has just checked in to Huslia. All the villagers are cheering her one, what a welcome. Once again, we hear “Dog team coming!” Down the trail we see Aliy Zirkle and her team of dogs. Aliy, too, is given a memorable welcome. She is greeted by villagers, their children, familiar faces, vets, and volunteers. She still has that warming smile on her face. She snacks her dogs while sharing memories with some villagers. Aliy even takes a little time to sign a few autographs before taking off down the trail. As I write this the dog lot is filled with about 11 dog teams. Some are taking their 24-hour break here in Huslia, while others will be heading back out on the trail. Checkers are expecting a rush of teams late tonight who are all bunched together about 20 miles out.